Non-profit Leapfrog says 15 hospitals across the country received failing grades. None of the failing hospitals are in the St. Louis area, but St. Anthony's Medical Center of St. Louis scored a D.
Fifteen U.S. hospitals — including two in Washington, D.C. — received failing grades in a new report on 2,600 hospitals released Tuesday that includes all 50 states for the first time. Maryland, which was previously exempted from providing hospital safety reports due to a special waiver, now ranks 46th on the non-profit Leapfrog Group's latest state rankings. Leapfrog is a watchdog organization that was started by employers and unions that wanted more public information about patient safety and quality. While the Centers for Medicare and Medicaid Services (CMS) rates about 90% of hospitals "average," Leapfrog is a much tougher grader. No other rating organization gives out anything equivalent to a D or F.
The grades factor in medical errors, infections and injuries, based in part on patient responses to surveys, data provided to CMS, the American Hospital Association and voluntarily to Leapfrog. The new ratings show significant improvements in five states since Leapfrog first issued grades in 2012. 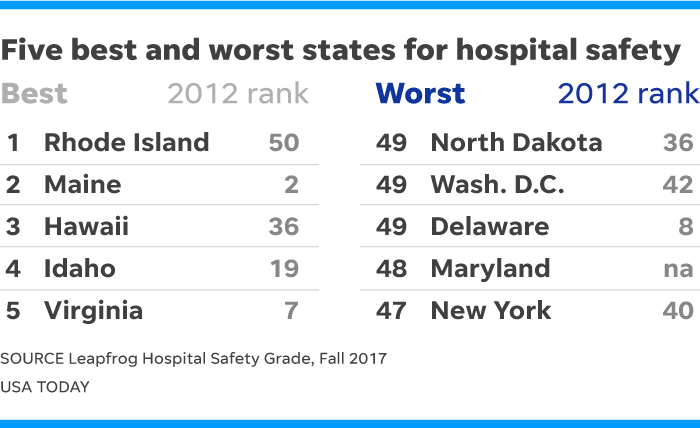 Oregon, Rhode Island, Hawaii, Wisconsin and Idaho showed the most improvement in the five years of the "Hospital Safety Grade." Click here to see the hospital rankings for the St. Louis area. There’s hope for patients in Washington, D.C., Maryland and elsewhere: UCLA Ronald Reagan Hospital got an F in Fall 2012; and five years later, they scored an A. Rhode Island had the safest hospitals on average, ranking 1st, while they were ranked 50th in fall of 2012. Nearly 80 hospitals that had gotten an F in the last five years are now up to a C or better, Leapfrog reported. Hospitals use positive ratings as a marketing tool, often buying billboards to tout their ratings. "It’s fine for a hospital to say they are excellent in their advertisements and brochures," says Leah Binder, Leapfrog's president and CEO. "But that’s not good enough for patients entrusting their lives to a hospital." Nearly all of the "F" hospitals catered to low-income patients of color, including in Washington, D.C., Baltimore, New York City and Los Angeles. Just how much scores should be adjusted to account for the socioeconomic status or race of its patients remains a contested issue. Patient safety advocate Helen Haskell says she does not favor so-called "risk adjustment' on the basis of socioeconomic status. Haskell, whose son died in 2000 of a reaction to medication after surgery, founded the group Mothers Against Medical Error. "It's fundamentally discriminatory," says Haskell. "It does nothing to improve care for the economically disadvantaged and may even put them at risk by holding their hospitals to lower standards." In Brooklyn, Brookdale Hospital Medical Center, dropped from a D to an F and had an increased rate of foreign objects left inside patients after surgery and was worse than the national average on 11 of the 15 errors and infections that Leapfrog measures. Those factors and responses to patient surveys led to the failing grade, Binder says. In Baltimore, where hospitals were rated for the first time, Bon Secours Hospital was the only hospital with an F. The Leapfrog grade "does not does not accurately reflect our quality or the essential role we play in improving the health and lives of residents in the west Baltimore community," the hospital said in a statement, citing its provision of housing, job training and other services. It got an F because of what Binder called "exceptionally high rates of three preventable infections" and a higher rate for wounds that split open after surgery, along with poor scores from patient surveys and fewer systems in place to prevent errors than other hospitals nationally. Bon Secours noted that it reviews "each and every quality ranking assessment with a strong commitment to improving our care." Maryland's waiver from federal reporting requirements was "designed to foster transparency and quality," says Jim Reiter, spokesman for the Maryland Hospital Association. He says hospitals must report on 65 complications compared to "just a handful" under the national program" and notes there was a 43% decline in complications between 2013-16. "Each and every hospital in Maryland has programs and initiatives in place to make sure the care their patients receive is safe and compassionate," he says. States that have made the biggest strides in overall hospital safety — including Oregon, Hawaii and Wisconsin — tend to have coalitions that are pushing patient safety, Leapfrog says. Rhode Island hospitals participated in national initiatives to reduce hospital-acquired conditions and infections, and many other local, regional and national safety efforts, which are "making a difference", said Teresa Paiva Weed, president of the Hospital Association of Rhode Island. In Washington, two hospitals — United Medical Center and Howard University hospital — both received F scores. Both hospitals have gotten their share of negative news coverage in the Washington Post in recent months. D.C. health regulators closed the obstetrics ward at United Medical Center this summer, the hospital has been run by an outside management company since last year and its emergency room was just taken over by a doctors' group associated with George Washington University Hospital. Howard's hospital was the subject of a Post investigation in March that detailed financial turmoil and what were described as serious gaps in care. Howard's CEO, James Diegel, said in a letter to the editor at the time that the hospital's financial status was "vastly improved" and assured the hospital has "realized quality improvements in virtually all appropriate care measures." Monday, he said in a statement that the hospital had "recently completed an evaluation by the Joint Commission that measures patient safety and quality of care, and anticipate full accreditation." "Our physicians and caregivers are proud to offer the services we provide to the community and continue to stand by and care for the District’s most vulnerable patients," said Diegel. Most of the data Leapfrog uses for its "Hospital Safety Grade" comes from CMS, which Binder says "applies highly sophisticated risk-adjustment formulas to its measures." The measures are then "exhaustively vetted" by a range of stakeholders and experts. 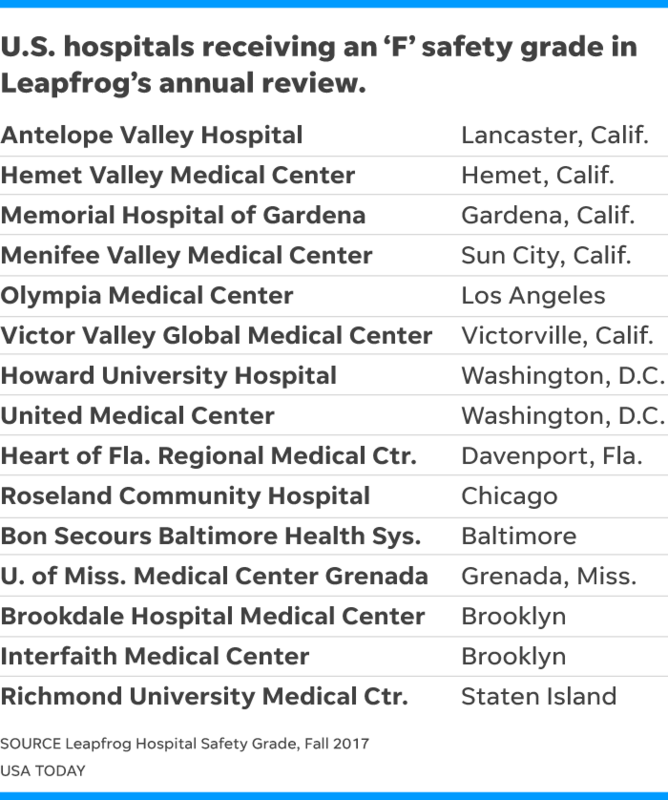 Leapfrog's safety grade "focuses only on the bad things patients want to avoid, like medical errors and infections," says Binder. She notes the problems are "all too common," with more than 500 people a day dying from preventable errors in hospitals. Binder says she's "encouraged that Bon Secours is using their grade as motivation to improve." "When hospitals take that kind of constructive approach, we always see rapid improvement," she says. "That’s what we all want."